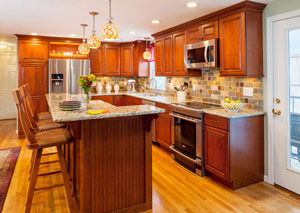 One of our most recent kitchen remodeling projects took place in Northborough, MA. Originally built in 1994, the family has lived in their home for 15 years. They wanted to remodel their kitchen from the moment they saw it, unhappy with the inefficient layout and minimal storage. 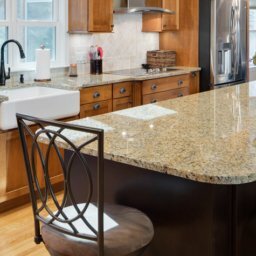 Laminate countertops beginning to show wear and tear. 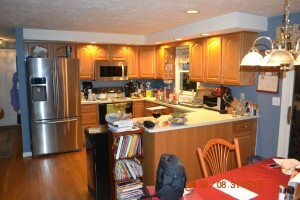 Overall lighting was poor and the recessed lights created shadows when doing tasks on the countertops. 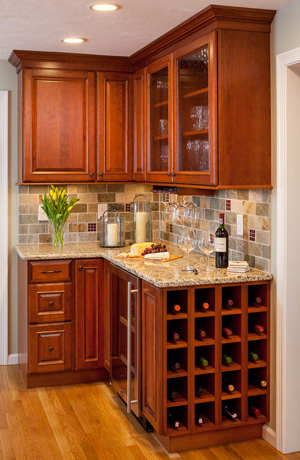 We installed beautiful new cabinetry with cabinets designed for specific purposes: spice cabinet, wine cabinet, fully extending roll out trays for ease of use and better storage. The multi-level island countertop effectively separates the task area from the eating/serving area. 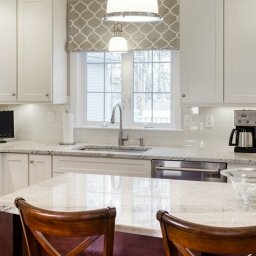 Fixtures and finishes were updated to improve both the function and the style, including: granite, tile backsplash, high arc faucet with integrated pull-down sprayer, deep 80/20 split sink. Many aspects of lighting were improved, general, task, and ambient/decorative lighting. LED lights were installed for under-cabinet lighting. LED is becoming the preferred in-cabinet and under-cabinet lighting choice. Lastly, decorative elements were incorporated to give a “wow” factor: open lit cabinet above the refrigerator, crinkle glass doors at beverage area, pieced glass pendant lights, and random glass tile inset into backsplash. View more photos of the remodel on our Facebook Page or learn more about our kitchen remodeling services.